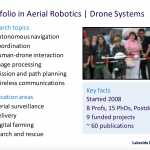 The University of Toronto maintains the Center for Aerial Robotics Research and Education (CARRE). Established in May 2015, it brings together a team of researchers from different disciplines. Program director is professor Hugh Liu from the Institute for Aerospace Studies. Part of CARRE is an education and research program with $1.65 million funding from the Natural Sciences and Engineering Research Council of Canada (NSERC) in its collaborative research and training experience (CREATE) program. As external collaborator in this program, I was invited to visit the Institute for Aerospace Studies and give a one-hour talk about my activities related to aerial robotics. Main host of my five-day stay was Angela Schöllig, assistant professor and associate director of CARRE. Another associate director is Jonathan Kelly, assistant professor. The lab visits included several demonstrations and poster presentations, covering a broad spectrum of topics that ranged from wind channel measurements over novel robot control and learning algorithms to drone swarming. I even had the chance to take a lesson in a very realistic flight simulator and fly over Honolulu. I would like to thank the entire team for enabling and funding this visit and for being such great hosts. I very much enjoyed our discussions and am impressed by your research spirit and results. 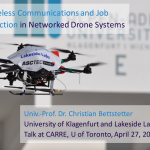 My talk entitled “Wireless communications and job selection in networked drone systems” was given on April 27, 2017. The audience consisted of professors, researchers, students, and advisory board members with backgrounds in aerospace engineering, robotics, and crisis management. I gave a quick overview of our research in Klagenfurt and showed a video illustrating our topics. The main part of the talk focused on (i) wireless communications and (ii) job selection in drone networks. There are certain particularities in wireless communications for drone networks. For example, the mobility of the devices is in the three-dimensional space, and communications typically involves both drone-drone and drone-ground links. Certain applications require high data rates (e.g., 80 Mbit/s for real-time 3D reconstruction) and low latency. The system must support a mix of different traffic types, such as video streaming and control data. All in all, it is a challenging setup. Most commercially available small drone systems use the WLAN standard IEEE 802.11 in one of its flavors. My talk gave a quick overview of this family of standards, ranging from 11a to 11ah. The questions we asked almost ten years ago for our experimental research were: How far do we get with off-the-shelf IEEE 802.11? Do we meet the requirements of certain drone applications? I started by addressing the antenna setup and presented our proposal to improve range by using three dipole antennas arranged in a triangle. Next, I discussed in detail the modeling of the wireless links. Our work shows that we can describe the links using standard models for path loss and multipath fading. The path loss exponent in our outdoor scenarios was always about 2, as in free-space environments. Multipath fading is modeled by Nakagami fading. I then presented some experimental performance results with 11a, 11n, and 11ac. Finally, I mentioned different possibilities for multihop networking in drones networks. Future work should test prototypes of new wireless technologies (5G) for low-latency, high­‐throughput, real­‐time aerial applications and develop a complete protocol stack for drone networks. Also a lobby for spectrum allocation for drone communications is needed. 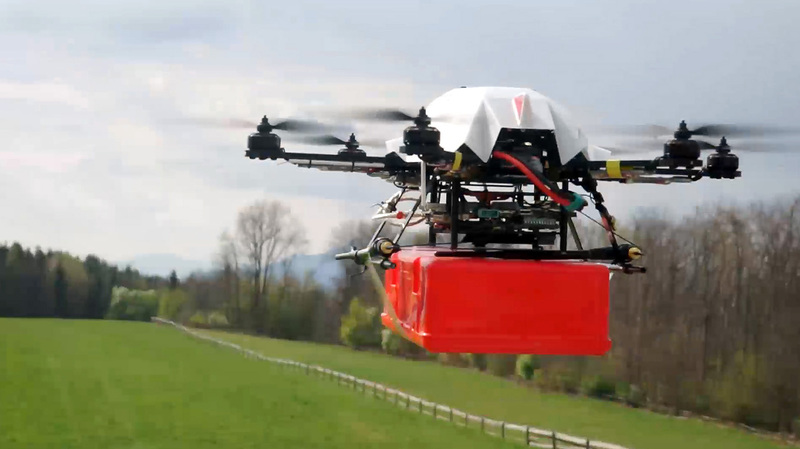 Drone-based delivery systems are very useful for a couple of applications. To give some examples, they can be used to deliver important goods to rural areas (such as the company Zipline does with blood delivery in Rwanda), very urgent goods (such as a defibrillator in case of an emergency or accident), and for the last mile problem in crowded cities. Such a system can be modeled as follows: Customers request goods that are stored in depots and delivered by vehicles. Customer demands (jobs) arrive over time on certain locations according to a space-time stochastic process. A fundamental question in this context is the network dimensioning: How much to invest, i.e., how many depots and vehicles are required to operate successfully in a certain area. 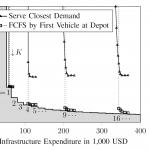 We derived a lower bound for the average delivery time as a function of the system costs. Next, we designed the system intelligence: Job selection makes all decisions needed to operate the transport system: Which customer demand to serve next? Which vehicle to let serve the next customer demand? At which depot to let vehicles load up goods? Which paths to let vehicles follow? Where to let vehicles return if no customers are waiting? Two classes of non-partitioning policies were analyzed: If job selection uses a policy in which the first job (FJ) is served first, the system may collapse to instability by removing just one vehicle (tipping point behavior). Policies that serve the nearest job (NJ) first show such threshold behavior only in some settings and can be implemented in a distributed manner. 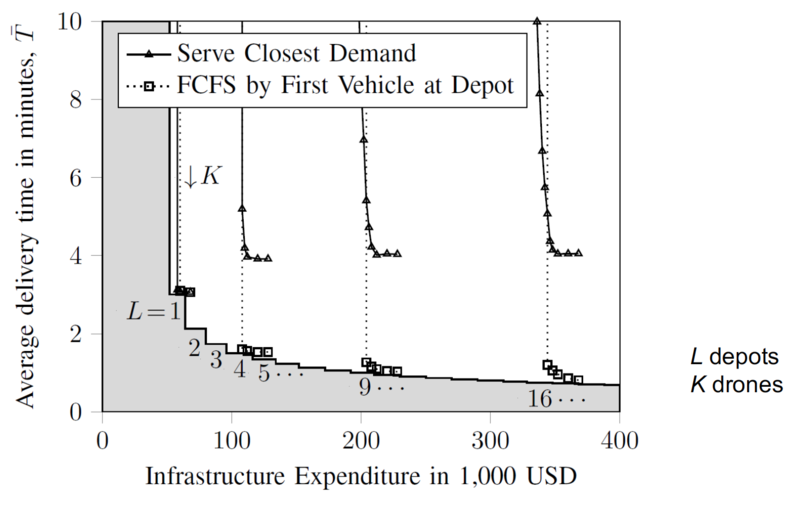 The timing of job selection has significant impact on delivery time and stability for NJ while it has no impact for FJ. The talk also demonstrated how near certain policies are to the theoretical bound for the system cost. 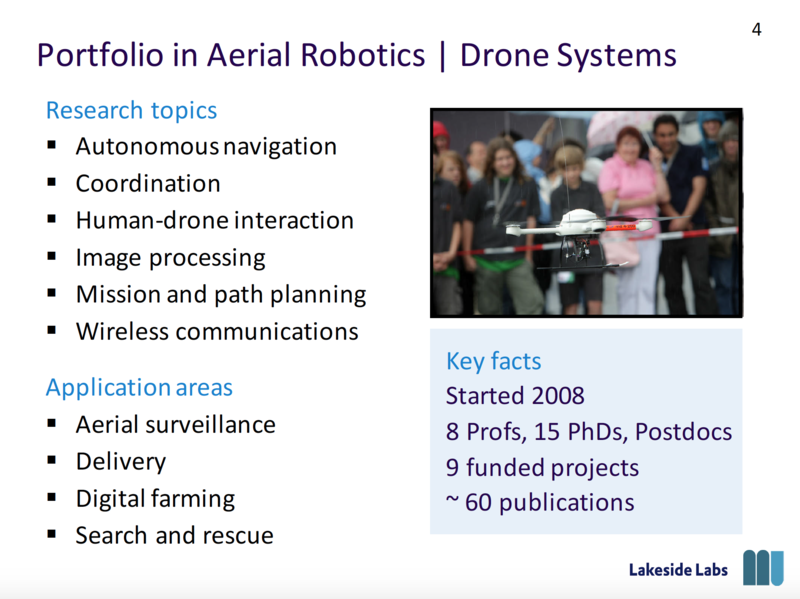 The talk concluded with an overview of the current project portfolio in aerial robotics at the University of Klagenfurt and Lakeside Labs, including autonomous forest inventorying, drone swarming, and the new doctoral school on networked autonomous vehicles. News about our work can be obtained at Dronehub K.
Hugh H. T. Liu is a professor at the Institute for Aerospace Studies of the University of Toronto, Canada, where he also serves as director of the Center for Aerial Robotics Research and Education (CARRE). He is also founder and CEO of Arrowonics, a company focusing on aerial light displays with drone swarms. He holds a Ph.D. degree from the University of Toronto. Angela Schöllig is a tenure-track assistant professor at the Institute for Aerospace Studies of the University of Toronto, Canada. She is also an associate director of CARRE. She holds a Dr. sc. degree in mechanical and process engineering from ETH Zürich, Switzerland. Christian Bettstetter is professor and founding director of the Institute of Networked and Embedded Systems at the University of Klagenfurt, Austria. He is also scientific director of Lakeside Labs, a research company on self-organizing networked systems. He holds a Dr.-Ing. degree in electrical and information engineering from Technische Universität München, Germany. Evsen Yanmaz, Robert Kuschnig, and Christian Bettstetter. Achieving air-ground communications in 802.11 networks with three-dimensional aerial mobility. In Proc. IEEE Intern. Conf. on Computer Communications (INFOCOM), April 2013. Evsen Yanmaz, Samira Hayat, Jürgen Scherer, and Christian Bettstetter. Experimental performance analysis of two-hop aerial 802.11 networks. In Proc. IEEE Wireless Communications and Networking Conf. (WCNC), April 2014. Samira Hayat, Evsen Yanmaz, and Christian Bettstetter. Experimental analysis of multipoint-to-point UAV communications with 802.11n and 802.11ac. In Proc. IEEE Intern. Symp. on Personal, Indoor & Mobile Radio Commun. (PIMRC), August 2015. Samira Hayat, Evsen Yanmaz, Timothy X Brown, and Christian Bettstetter. Multi-objective UAV path planning for search and rescue. Accepted for Proc. IEEE Intern. Conf. on Robotics and Automation (ICRA), May 2017. Pasquale Grippa, Doris A. Behrens, Christian Bettstetter, and Friederike Wall. Job selection in a network of autonomous UAVs for delivery of goods. Accepted for Proc. Robotics: Science and Systems (RSS), July 2017.